The Internet is many things to many people, but for families with loved ones in a war zone, that is one of them. It’s a sad, yet inevitable fact, given the modern-day news cycle, social networking and the hundreds of ways in which information is shared in 2011. It’s the down side to all the positives we have, like being able to send friendly emails across the world that cheer up those we care about in a matter of seconds. For another reminder of that, we need to look no farther than the story of Cpl. 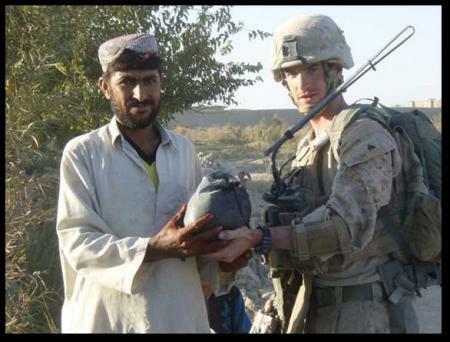 Chad Wade, a member of 2nd Battalion, 1st Marines, out of Camp Pendleton, Calif. He was killed by an improvised explosive device while on patrol Dec. 1, and four months later, the grief shared by his friends and family continue to spill out in new and painful ways. Wade’s wife, Katie, had been blogging about her life since January 2010 on Wade’s World, allowing her to chronicle the early days of her marriage and share them. She continued after her husband’s death, sharing her pride, sadness and fear. It took courage to stay with it, and grace to write about such a painful situation with class and humility. The site became much more public after Stars and Stripes writer Meg McCloskey featured Katie in a touching story published last week. In typical modern-day fashion, I found McCloskey’s story after she posted a link to it on her Twitter page. We’ve never met, but we follow each other’s work on Twitter, a fantastic resource for journalists looking to absorb as much information and context as possible. Like many others, we share stories and updates frequently, even when traveling on assignment abroad. My page is posted here. It is with that lens that I read a Wall Street Journal story by Michael M. Phillips published Friday. Gritty and passionate, it shares how Wade’s fellow Marines coped with his death. Immediately, I thought of Katie and her blog, and how difficult it must have been to read the stark details in the Wall Street Journal report. The update gave me pause. As a professional, I thought Phillips’ story was well-reported and respectful. Gripping, even. It also was done from Afghanistan, where the Marines who knew Wade shared how they coped with his death. It’s the kind of journalism that raises questions over what the U.S. should do to support its service members, and how little the average American knows about the life-and-death situations some of them face. As a human being, I felt differently. A little guilty, even. Like Phillips, I wrote about death and danger and heartbreak when I was in Afghanistan last year. Many families read my work and interacted with me cheerfully on this blog during my embed, but I have no doubt that the details had to be hard to read. In reality, the grim situation I found myself in — on the ground in Marjah with firefights unfolding daily — was terribly hard on my own family, especially considering my descriptions of it flashed across the Internet each day. I’m probably rambling at this point, but maybe there’s a teachable moment in Cpl. Wade’s story. No matter how well intentioned military journalists are, some of their work will sting families who don’t deserve additional pain. There’s no joy in that. However, failing to publish those painful stories and take on those scary assignments will only leave the rest of our country in the dark about a fight directly involving 100,000 U.S. service members each day. It must be done. This is a harsh, cold reality of war. I don’t like it, and I’m sure you don’t, either. Dan, I am CPL Wade’s Aunt. On behalf of Chad’s family I found it an honor that they chose my nephew to tell his story. My family was concerned about having such vivid details of his death out there in print for the whole world to see, but the journalist took his mothers considerations to heart and kept us updated as the story progressed to print so we could be prepared. We couldn’t tell him what to write and not write but I do believe he did an amazing job. If only one person was moved by the article I have to trust it was worth telling. This war has gone on for so long, so many soldiers sacrificing their lives to insure our freedom, and out of all of them they chose Chad. He has touched so many in his life and now even in his death. They say this is the “forgotten war” but to the families who have lost loved ones, there is nothing FORGOTTEN about it. Our family stands by Lance CPL Voie and thinks he did an amazingly well to bring his heartbreaking story to the American people. To shed light on a grim, devastating situation….a reality that is shared by so many. He which hath no stomach to this fight let him depart. But we in it shall be remembered. We few, we happy few, we band of brothers!! For he today, that sheds his blood with me, shall always be my brother!!! On behalf of CPL Chad Wade family. I hope you tell the whole world, so that NO American will ever FORGET what our boys go through! Stacy also shared that her sister — Cpl. Wade’s mother — has been blogging for months, too. Her site is online here. DAN, YOU ARE DOING A SERVICE TO ALL WITH YOUR REPORTING. WHAT IS NOW KNOWN AS MAIN STREET MEDIA WOULD BE WELL SERVED, WERE THEY TO TAKE A PAGE OUT OF YOUR PROFESSIONAL APPROACH TO THINGS. Thank you for all your heart you put into your PURPOSE in this life!!! The families of the fallen and I appreciate your illumination of the truths as we grieve over our losses. We know we cannot bring our loved ones back, but if other families can learn from our stories and certain truths may receive the justice and light they deserve, then you have contributed to such a great healing process to our Gold Star Families all over the country!!!! God Bless you Dan, and God Bless all of our Gold Star Families and Fallen Heroes!!! May they NEVER be forgotten but celebrated in the very light they gave back to this country!!!!! Proud to be an American!!!!! I too am CPL Wade’s maternal aunt. I am known as Aunt Paige and your story as well as the Wall Street Journal has touched our life in so many ways. The out pooring of love total strangers have for our Nephew is amazing. In so many ways Chad has changed my life personally for the better. We are a very close family and to be so blessed by the number of new “family” members we now have in our extremely wonderful family, is amazing to me. This band of brothers Chad brought into our life have reached out to everyone of us as well as thier wives and that alone is touching. You nor everyone out there may never know how honored and blessed we are. Please continue to follow these blogs for they tell the real stories… I am thankful for everything you have written about our wonderful “Chadman”. dan, as a marine father i try to find every little bit of imformation i can get.on the other hand my wife wont even watch the knews when our son is deployed.Cpl. wades family has given the ultimate sacrifise we all owe them. Thank you for all your hard work. Keep it up. You do us proud. Thank you for sharing Dan. The blog by Cpl. Wade’s wife is amazing. A very touching story.